If whales and dolphins are your thing then this interview with Anna is a must read. Also if you think dream marine conservation jobs are all off in the tropics Anna will tell you otherwise! I’ve always had a huge passion for the sea, always spending my holidays snorkelling and rockpooling in the UK and abroad. However, it was going up to Scotland and seeing wild bottlenose dolphins when I was about 11 that got me really interested. Since then, I’ve been researching and learning about marine mammals non-stop. If I am honest, I didn’t know careers like this existed until about five years ago, despite this keen interest. I certainly didn’t think you could get paid for it! I ended up studying Geography at university, as it was my favourite subject at school, where I ended up focussing on nature conservation. But after working and volunteering for terrestrial wildlife charities, I knew my heart was at the seaside, so I tirelessly volunteered as much as I could to get as much experience as possible in this field. I checked marine job websites, like WiseOceans and Environmentjob every day! I searched for my ideal jobs and looked at what the ideal candidate needed, qualification wise and experience wise. I then worked to gain these skills through volunteering. After working in terrestrial conservation for a year after university, and then spending a summer on the Isle of Man volunteering in marine conservation, I was lucky enough to get a place on the Marine Graduate Training Scheme for the Cumbria Wildlife Trust which gave me all the skills I needed for a job in marine conservation. I went on an ORCA I-Spy (now known as Sea Safaris) whale and dolphin watching mini cruise with my mum whilst I was doing this traineeship, and from then on I was hooked on watching and surveying for whales and dolphins from ferries. I did ORCA’s Marine Mammal Surveyor course a few months later. 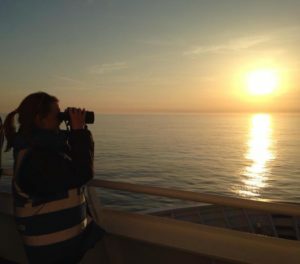 When the Wildlife Officer position came up with ORCA, living on board the DFDS King Seaways ship for 6 months, running a wildlife centre, I could not think of a job I wanted to do more!! I had gained all the skills needed through my volunteering and work with the Cumbria Wildlife Trust. Once I had completed a fantastic season on board the King Seaways, spotting harbour porpoises, white-beaked dolphins and Minke whales every week, this job came up at ORCA’s HQ in Portsmouth, so I applied for it and was lucky enough to get it. 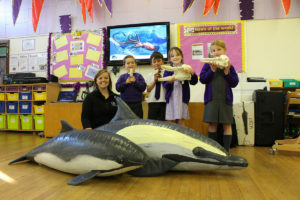 I love inspiring children about the marine wildlife right on their doorstep, a lot of people think you have to go all the way to Australia or America to see whales and dolphins, but we can see them right here in the UK! Their faces light up when you talk about how big the blue whale is or how an orca is such a great predator. We also talk about their effect on the marine environment, and how by reducing, reusing and recycling plastics can make a huge difference. 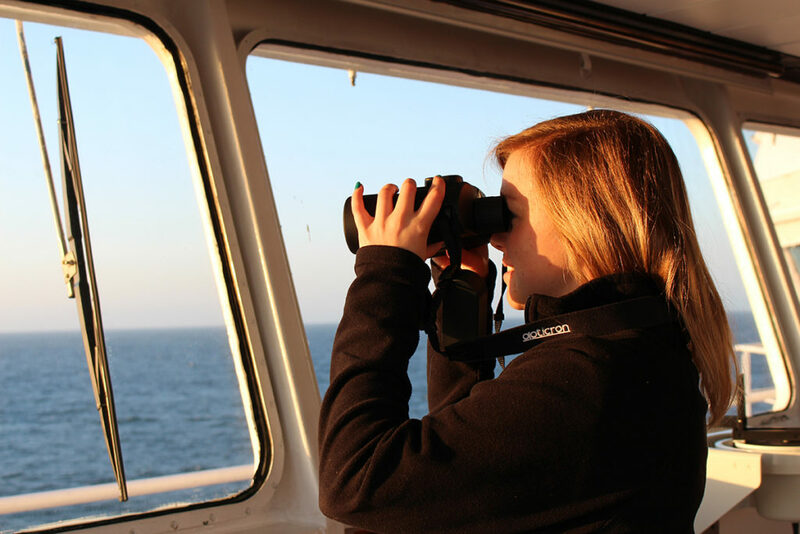 And, of course, I enjoy being a wildlife guide on our I-Spy trips and I absolutely love being a team leader for our ferry and cruise ship surveys – seeing whales and dolphins in the wild gives me the same uplifting and ecstatic feeling as when I was 11 in Scotland! A lot of the schools I speak to go on to do beach cleans or start up recycling schemes in their schools after I’ve visited, so that is very rewarding. I wish that I knew the huge variety of wildlife conservation charities that there are, especially in the UK. Maths – as my role is funded by the Heritage Lottery Fund, I have to manage budgets and do quite a bit of number crunching!! I feel that a lot of UK students forget that there are so many fantastic wildlife conservation charities and volunteering opportunities in the UK. A lot of students tend to spend their time (and huge amounts of money) volunteering abroad. If you want to work in the UK, I would strongly suggest volunteering in the UK – there are so many incredible charities here! Make sure you research your ideal job, and even if you don’t have all the skills and experience to apply for that job currently, at least you have something to work towards. Linkedin is also a great way of looking at what other people have done to get their ideal jobs, too. I think it has to be the orca – they are such powerful and intelligent creatures, with beautiful colouration. I also find it fascinating that different populations speak different dialects, and all the different feeding strategies they use are so clever, whether that’s knocking seals of ice packs or corralling herring with their echolocation calls and strong tails flicks. My most unforgettable moment at sea was whilst volunteering for ORCA on one of our cruise ship surveys up to Norway. All of a sudden, we were surrounded by over 30 orcas and 20 fin whales, all feeding on herring! It was a feeding frenzy! All the passengers were out with us on deck, and got to share this incredible moment with us. It took us over half an hour to sail past frenzy, and the orcas came as close as 20m from the ship, it was just incredible. A moment I will never forget. Thanks Anna! Inspirational stuff and just shows not only how vital volunteering is but what amazing opportunities there are in the UK too. 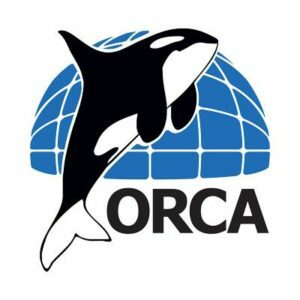 To keep up to date with ORCA’s work and to get involved, see the website (www.orcaweb.org.uk) and their social media channels.